Probably many of you have already noticed that recently besides folders in your inbox some numbers have begun appear intermittently. Besides different numbers appear to different folders. 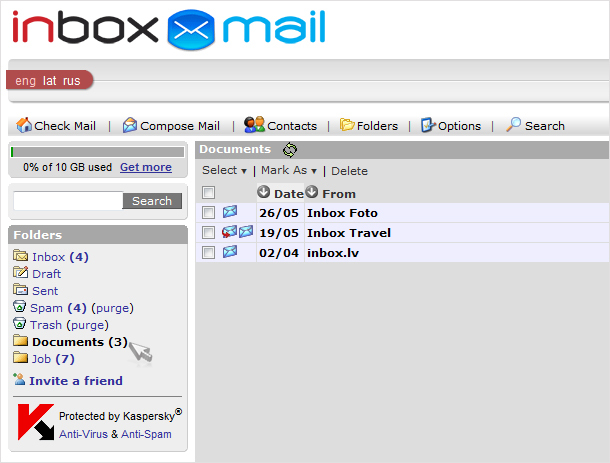 Those numbers in brackets depict the count of unread messages (e-mails) in a specific folder. 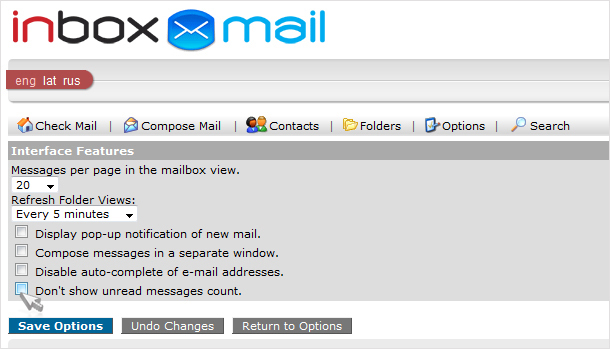 This new option appeared in Inbox Mail by the end of this spring and has made the check out of new e-mails even more convenient. You don’t have to check out every folder regularly to make sure that no message has been lost somewhere among them all. We want to stress that this new option applies to all folders in your inbox at once. Please, take notice that it also applies to the “Spam” folder. It is known that sometimes even important e-mails tend to get into this folder by mistake. Now, when it happens, Inbox Mail will let you know immediately. In case you don’t need this new option or it becomes a burden, you can switch it off at any time. To do so, go to “Interface features”, mark option “Don’t show unread message count” and save changes. Inbox.lv – freely available in more than 2000 WiFi ports in Latvia!